Once you choose from the hundreds of wood species available, then you have thousands of different stain options. Hardwood flooring is extremely versatile. Many people think that all hardwood basically looks the same, but that couldn’t be further from the truth. Once you choose from the hundreds of wood species available, then you have thousands of different stain options. This means virtually endless combinations, so that you can find hardwood flooring and stain that matches your needs and individual style. When choosing hardwood stain for your home, there are a few things you will need to consider. What Species of Wood Are You Finishing? First, you will want to consider the specific wood species you’re going to stain, because different species tend to reach differently to the staining process. Birch, maple, and pine flooring, for example, can be quite difficult and in some cases, may even look better without staining. On the other hand, oak tends to be easier to stain and comes in many different colors. When you’re choosing your stain, consult your contractor to find out which ones will be good options for you. How Much Lighting Will There Be? It may sound a bit odd, but your home’s lighting does actually affect your hardwood stain options. The level of light, either natural or artificial, and how much of the wood’s natural character you would like to display will both play a role in the color of stain you choose. Is it A High-Traffic Area? 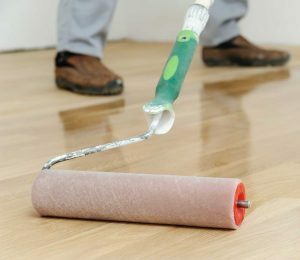 No matter how well you maintain your wood flooring, it will start to show some wear over time. Choose a darker stain for your home’s particularly busy areas to mask some of these imperfections. You can go lighter with your stain color in a room that doesn’t get quite so much activity. If you’re going for that traditional, homey feel, you should lean towards the lighter stain colors. For a more modern look, darker stains should be your go-to. You can search the internet for design ideas so you can get your ideal look. This entry was posted on Thursday, November 9th, 2017 at 3:59 pm. Both comments and pings are currently closed.